Two years ago, overtaken by the irresistible lure of family, Kevin Lanier moved from the Seattle area, where he had concluded his career as an air traffic controller, to Mexico Beach. Mexico Beach appealed to him for two reasons. It was within a day’s drive of family members scattered from Atlanta to South Florida. And it was on the water. Lanier, who grew up in Douglasville, Georgia, has been a sport fisherman all his life. He vacationed as a child in Panama City Beach and recalls with fondness his first saltwater fishing trip in 1969 aboard a party boat out of Capt. Anderson’s Marina. His retirement in 2013 afforded him an opportunity to go into the business of fishing. He ran charters out of Westport, Washington, trolling for salmon and albacore tuna, and bottom fishing for halibut. When he moved to Florida, his boat, a 34-foot Luhrs built for big water, came with him, and he joined five other charter boat captains who operate from Mexico Beach’s canal. Today, Lanier’s vessel is on blocks at a Panama City boatyard where it rode out Hurricane Michael, and the Mexico Beach canal is impassable, filled with sediment and storm debris. Will Lanier be back in business in time for the spring run of Spanish mackerel? Lanier was lucky, he will tell you. His business, unlike most others in Mexico Beach, was portable. His boat sustained only minor damage to bow rails and the tuna tower. His home, six miles inland, was undamaged. The trees that surround it served to buffer the storm without becoming projectiles. Recently, Lanier was among a number of Mexico Beach business owners whose post-Michael circumstances were documented by his daughter and son-in-law, Chelsea and Alex Workman of Tallahassee, and by Jeremy Cowart of Nashville. The Workmans are aerial photographers and storytellers. Cowart is a still photographer. In 2016, Alex Workman and Cowart combined to capture the stories of victims of the Great Smoky Mountains wildfires in Gatlinburg, Tennessee. The stories were posted to a fundraising website (voicesofgburg.com) that generated more than $100,000 in contributions. Workman figured that that the best way to promote Mexico Beach’s recovery was to speed its economic recovery by helping businesses reopen their doors. “That was our big idea,” he said. It was refined by friends including a policy director with the Florida Department of Economic Opportunity who is familiar with the effectiveness of “micro-grants” awarded to businesses in Houston following Hurricane Harvey. In Gatlinburg, Cowart photographed fire victims lying on mattresses that were placed where their bedrooms used to be. Topped in white sheets, the mattresses provided a sharp contrast to the surrounding ash. But a white sheet provides little contrast to white sand, so Workman photographed storm victims lying on a big red heart — 8 feet tall and made by volunteers — and surrounded by rubble. Those images may be found at neverforgottencoast.com. At this writing, a micro-grant application is also located on the website. On Dec. 31, Workman announced via news release that the grant program would be conducted in partnership with the Mexico Beach Artificial Reef Association, a nonprofit that has managed millions of dollars in federal funds. 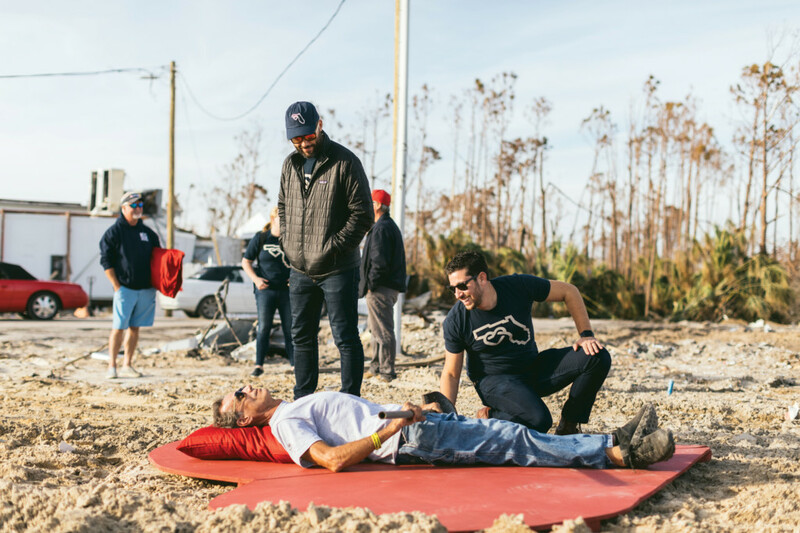 The association amended its mission statement after the hurricane and began receiving donations to a variety of hurricane recovery initiatives that were not set up to receive contributions. On Jan. 17, Workman reported that an initial round of $1,000 grants had been awarded. The recipients were: Forgotten Coast Realty, KC Sportfishing, Killer Seafood, Lookout Lounge, Mexico Beach Development Council, Mexico Beach Marina, Pristine Properties Vacation Rentals, Sharon’s Café, and Splendiferous MB (a women’s clothing store). Jesse Taylor, a Tallahassee graphic artist, created a Never Forgotten Coast logo — an outline of Florida intersected by a heart that encloses much of the Hurricane Michael devastation zone. Cowart said the devastation in and beyond Mexico Beach was far greater than he anticipated.